One of the greatest benefits of being the Cupcake Activist is being able to eat cupcakes frequently. I call it "research." A few weeks ago I was contacted by Monica Serratos, the owner of a new cupcake company in Mission Viejo called Two Parts Sugar. She asked me to try some of her cupcakes. Of course, I was thrilled! 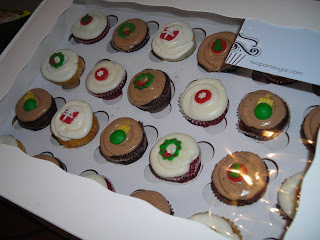 On Christmas morning I received a special gift--two dozen mini cupcakes! I can honestly say this was my yummiest present! My family and I snacked on the cupcakes for Christmas brunch. One of my favorite characteristics of Two Parts Sugar's cupcakes are the unique flavors. The red velvet I tried wasn't just a plain red velvet, it was raspberry red velvet. I love trying out new flavors! I also ate a chocolate and vanilla bean cupcake. The cake was moist on all of them and the frosting was delicious, not too heavy but perfect for these mini cupcakes. My family and I give Two Parts Sugar a thumbs up! Two Parts Sugar is a made-to-order cupcake company. Their cupcakes are $30 for one dozen normal-size cupcakes or two dozen mini cupcakes. They offer free delivery within a 15-mile radius from Mission Viejo. They also bake special occasion cakes. Check out their website and blog for more details. Cupcake activist, thanks so much for the review! It always brings us joy when we can share our yummy creations with fellow cupcake lovers! We are really looking forward to coming up with new recipes and adding them to our list. Thanks again for the great review! oh these look so delicious...i'm having a major sugar craving now.